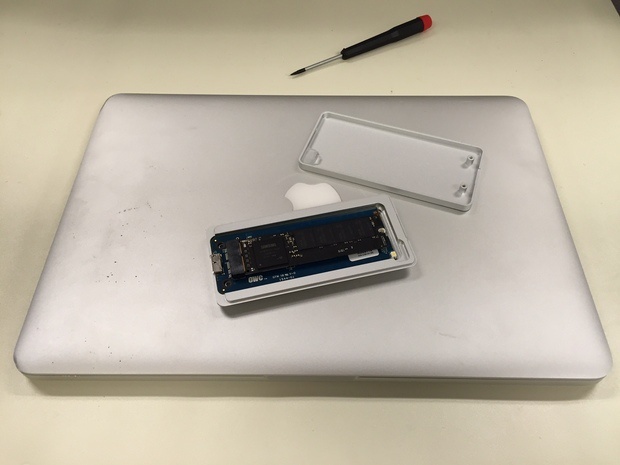 When Apple began shipping the MacBook Pro Retina in late 2012, it announced that the built-in solid state-drive (SSD) and RAM would not be user upgradable after purchase. Well, the RAM part of that statement turned out to be patently untrue. That's a simple piece of hardware to locate. But Apple's proprietary PCIe SSD modules proved impossible to find. Then along came Other World Computing (OWC) to single-handedly fight Apple's planned obsolescence for MacBook Pro laptops with retina diplays. This month, OWC began offering MacBook Pro Retina- and MacBook Air-compatible Aura PCIe SSDs. If you purchased a MacBook Pro Retina in 2012 or later, you already shelled out at least $1,300 for the 13-in. model. So, it's reasonable to assume you might have skimped a bit on the internal storage, which ranges from 128GB to 512GB. Heck, even if you splurged and purchased the highest-end 15-in. MacBook Pro for $2,500, the largest SSD you could get until recently was 512GB. Note: A 1TB SSD is now a $500 option for the current top-end MacBook Pro (vendor price). What's incluced in the OWC Aura PCIe SSD upgrade kit. The new OWC Aura PCIe SSDs for MacBook Pro Retina laptops come in 480GB ($348) and 1TB capacities ($598). You can also purchase a complete upgrade kit, which includes the OWC SSD, screw drivers, a USB standard A to micro B cable and an external PCIe SSD enclosure with USB 3.0 port for $399 (480GB model) or $649 (1TB model). 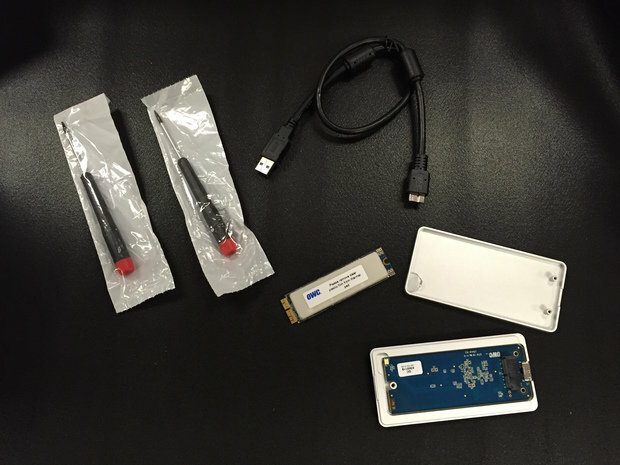 The kit is actually a pretty good deal because just to purchase the Envoy Pro SSD enclosure would cost you $79. Once you've installed the OWC SSD, you can use your Mac's original flash drive in the enclosure as a fast external USB drive with transfer speeds up to 355MBps. I've said it many times before: Adding an SSD to your computer is the single best upgrade you can perform for the money. It improves both performance and reliability. But, when you already have an SSD, the next best upgrade is a bigger SSD. The OWC PCIe SSDs allows you to increase the capacity on your MacBook Pro up to eight times that of the factory drive and it offers up to 5.8 times faster performance than Apple's factory installed drive. The OWC Aura PCIe SSDs offer up to 763MBps sustained read and 446MBps write rates. They also come with native AES 256-bit encryption and a three-year limited warranty. Prior to installing a new OWC 1TB Aura SSD, I performed a performance benchmark test on my factory installed 256GB PCIe SSD using BlackMagic software, a free app. As expected, it was blazing fast, offering up to 723MBps sustained reads and 661MBps writes. I was excited to see just how much faster OWC's SSD would push the MacBook Pro's performance. Using BlackMagic disk benchmarking software, I tested the Aura PCIe SSD once it had been installed. It revealed a maximum read/write speed of 700MBps and 423MBps, respectively. In other words, the OWC SSD had slightly slower performance than my factory installed SSD, but the difference was not noticeable. First things first. Upgrade the to the latest version of OS X -- in this case it would be El Capitan v10.11.4. Next, because you're not likely to simply swap out the OWC SSD for the factory drive without migrating data over, you'll want to perform a Time Machine backup to an external drive. This will safeguard your data in case something goes wrong. 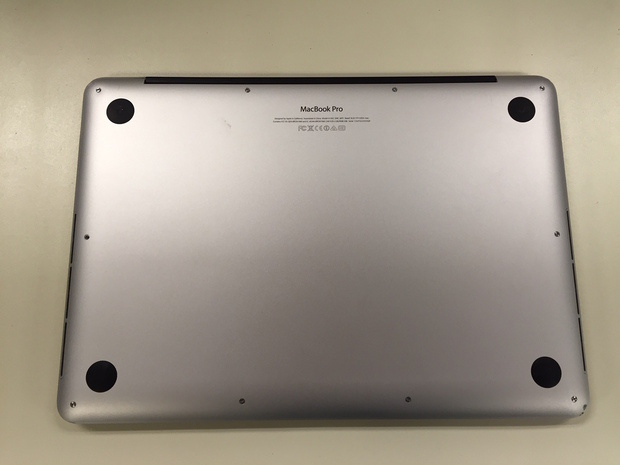 You'll first need to remove the 10 pentelope screws securing the rear cover of your MacBook Pro. Swapping out your flash drive, whether it's a 2.5-in. SSD or a PCIe card, is about the simplest upgrade you can attempt. It'll take about 10 minutes, not including the data migration. While I've swapped out dozens of SSDs without one, you should consider purchasing an anti-static mat on which you'll perform the upgrade; they're about $12 to $15 online, and when you consider you just spent up to $649 on an SSD, it's a small price to pay to avoid damaging the NAND flash chips. The factory-installed Samsung PCIe SSD is in the upper right hand corner. 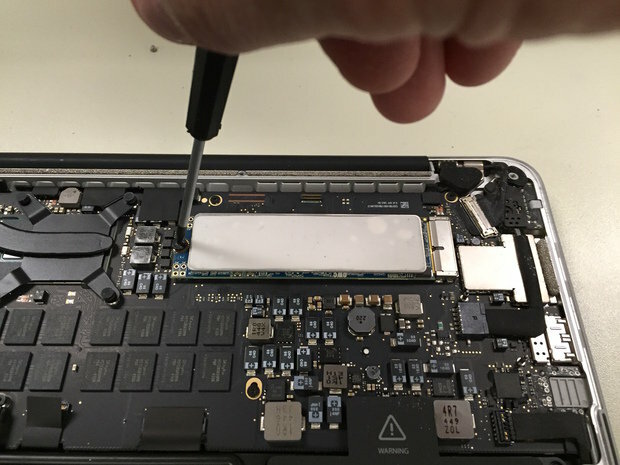 The first step to changing over your SSD is to remove the 10 screws on the back cover of your MacBook Pro using a Pentalobe P5 screw driver. Next, you'll need to unscrew the one Pentalobe screw holding the PCIe SSD in place. Remove the SSD retaining screw using a Torx T5 screw driver. 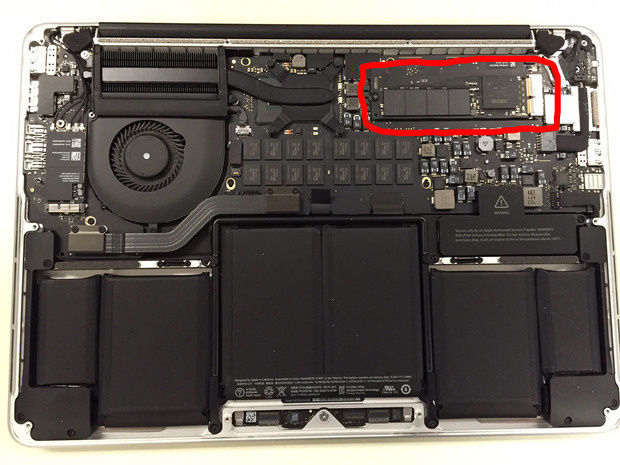 Then you simply pull the SSD from its socket, insert the OWC SSD and secure it with the screw. That's it. 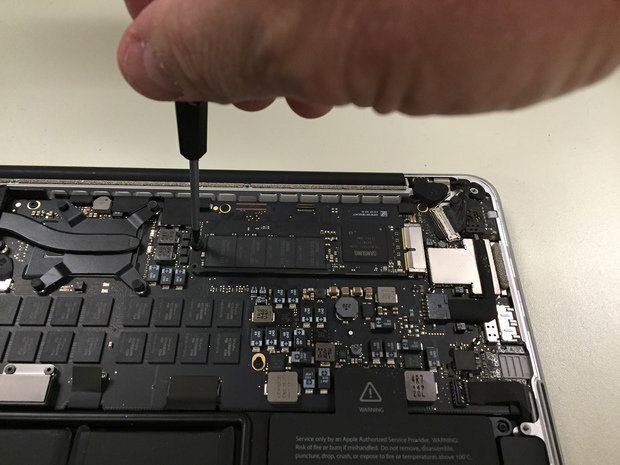 The only thing you need to do is to replace the MacBook Pro's rear cover and either download a fresh version of OS X onto your new SSD, or migrate the OS and your data from the old drive. After gently pulling the factory-installed SSD from its PCIe socket, insert the OWC Aura PCIe SSD and re-attach the Torx retaining screw. There are couple of ways to install OS X El Capitan onto your new OWC PCIe SSD...or at least there should be. You should be able to install it using the external adapter. But once I uploaded El Capitan, my MacBook's native drive refused to recognize the external drive. So I was forced to install the OWC SSD first. As you power up the computer, press the CMD + R keys to access the disk recovery menu. That allows you to choose the internal drive for the OS X download. But, a funny thing happened. Apple would only allow me to download Yosemite onto the new drive. So, Yosemite came first, then came the upgrade to El Capitan, which took an additional 20 minutes. When you're finished installing the OWC Auro PCIe SSD, you can insert your factory SSD into the PCIe adapter and use it as an external drive so it doesn't go to waste. Now that you've got OS X El Capitan on your OCW SSD, you'll need to migrate the data from your original SSD. There are several ways to do this. You can use an updated Time Machine backup, but I prefer to simply insert the factory SSD into the OWC adapter, plug it into the USB port and then go into the Utilities folder and select the Migration Assistant. After that, it's just a matter of selecting the source drive (your factory SSD connected via the USB 3.0 cable) and the target drive, your new OWC SSD. I had 240GB worth of data to migrate, the process took about 45 minutes. I can't emphasize enough what a relief it was to avoid having to dump data off my old drive in order to free up space. With the new 1TB Aura SSD, I've got plenty of breathing room for years to come. And, if I ever decide to get a new laptop, my mid-2013 MacBook Pro will have at least as good an SSD as Apple is likely to offer any time soon.